The Little Tokyo Community Council’s welcome reception for Los Angeles City Councilmember Jose Huizar will be held on Tuesday, March 26, from 6 to 8 p.m. at Far Bar, 347 First St. (between San Pedro and Central) in Little Tokyo. Huizar represents the 14th Council District, which encompasses Little Tokyo, Boyle Heights, Eagle Rock, El Sereno, Downtown Los Angeles, Garvanza, Glassell Park, Hermon, Rose Hills and Highland Park. 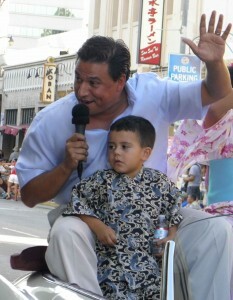 Huizar was elected to the City Council in 2005 and overwhelmingly re-elected in 2007 and 2011. He is also a member of the Los Angeles County Metropolitan Transportation Authority Board of Directors. Prior to his council election, he served as a member and president of the Los Angeles Unified School District’s Board of Education. Born in Zacatecas, Mexico, Huizar received a bachelor’s degree from UC Berkeley, a master’s in public affairs and urban planning from Princeton University, and a juris doctorate from UCLA School of Law. He is the first Mexican immigrant elected to the City Council in Los Angeles’ history. He resides in Boyle Heights with his wife Richelle Rios, their son Simón and three daughters, Emilia, Isabella and Aviana. The Little Tokyo Community Council is a nonprofit with over 90 member organizations whose mission is to ensure that Little Tokyo is a viable center for the Japanese American community and the Los Angeles Downtown community. The council works to create a vision of what Little Tokyo should be in the future and serve as an advocate on behalf of the Little Tokyo community.